Strangely, most 4x4s never venture off the tarmac! Stranger still, many 4x4 drivers would just like to see what the vehicle can do, but havent got round to it yet. This is probably quite wise, as driving off-road requires skills that you did not need for your driving test. Getting your 4x4 stuck in a muddy gateway, or worse, ending up in a ditch, can be very embarrassing! 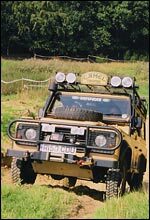 At Overland Pursuits, we have specifically designed our Stage 1 training courses to cater for the 4x4 driver who would like to have the confidence to drive off road should the need arise. This means it is challenging, but can be driven by even the smartest of vehicles without fear of damage. Whether you are just starting out on your off-roading career, have some experience but would like to learn more, or if you are just looking for a fun day out, we can provide the programme that you need. CarVeto is the only car checking service to block a motorists decision to buy a used car until is has passed their history check. Get a free CarVeto check, instantly. Overland Pursuits can help if you're buying a car. Start by checking this video from Used Car Guy that outlines online checks. Overland Pursuits.